The good guys avert nuclear war with minutes to spare! Secretary Elizabeth McCord (Tea Leoni) throws her hat in the ring! We find out who on Bess’ staff is on the list to be saved from incineration — Chief of Staff Jay Whitman (Sebastian Arcelus)! 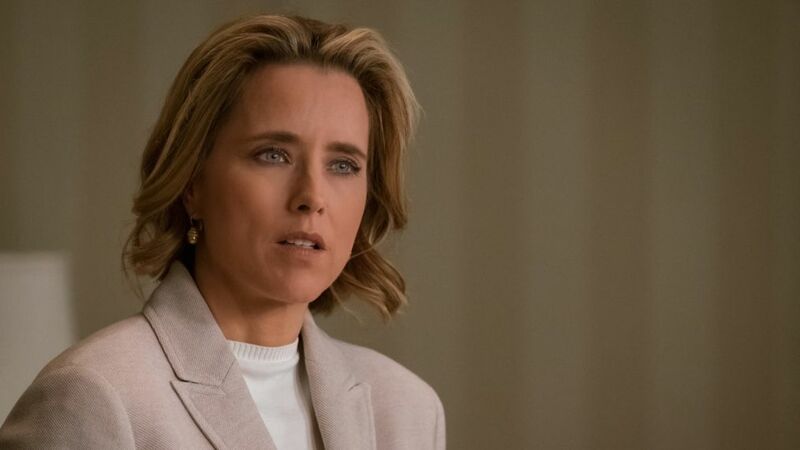 TV Insider spoke with Madam Secretary’s executive producers, Barbara Hall and Lori McCreary, about tonight’s suspenseful and you might say enlightening season finale. With world devastation barely averted, Elizabeth’s passion to defuse the nuclear hair trigger, and her decision to check out running for president, the season finale would have been a slam dunk series finale. Good thing word was out that you were renewed. Barbara Hall: I know; we were actually worried about that. But we’re back! Let’s start with Elizabeth’s surprise announcement. Will next season be about feeling out a run gathering money and support? Or will you move ahead quickly? Hall: We’d like do it in as much real time as possible because our show is always about revealing process, lift the curtains on aspects of politics people might find interesting. We’ll do that with the election run as well, start from the beginning and have a year of gearing up and a year of the campaign. She’ll still be Secretary of State next season. Lori McCreary: It will upheave the staff’s world but they’re going to have to keep the rest of the world running smoothly. Elizabeth still has some ideals left, and electioneering recently is downright nasty. Will part of this arc examine whether she can keep her soul? Hall: Part of the fun for us will be that she could see what’s involved and decide not to run. But we want to take her on that journey to discover whether she can maintain her integrity and run for president. Was her decision made because she saw how close we were to blowing up the world when our defense system mistook a simulation for a Russian nuclear attack? They had less than 10 minutes to assess the situation. Hall: I think having lived through that experience, her passion has become getting the nuclear hair trigger system changed . McCreary: I’d say it came to a head when she was the lone voice against the status quo and she gets the president to agree that they could do something different. Were you inspired by the similar event that happened in Hawaii a few months back? Hall: We talked about this last year, but we were daunted by the research. We seriously talked about doing an episode about a possible nuclear attack again, and as usual, once we start planning something, a terrible situation comes up. We wanted the show to be about the alerting system, because it’s not our show to terrify people. McCreary: Even though it was scary to look at this with a magnifying glass, we thought it was something that was enough of interest to people that it would be something that really resonated. Do you want to get a discussion started with this storyline? McCreary: I would love to start the discussion. Our mission statement is to reveal the policy process and then invited you to the discussion. We hope that we fairly represent both sides of the argument. Hall: We researched everything within an inch of its life and got as close to the process as we could get; some details obviously are classified. Hall: Most people think the nuclear football was a button that you push. McCreary: Or a red phone. Hall: It’s just a menu of options. And in reality, the worst one is probably the only one a president would pick in the five minutes he or she has to decide. The system is built for speed and there are no checks or balances on that decision. Is there any Congressional interest in slowing down the system to prevent overreaction to a misreading of the situation like on the show? Hall: There is bipartisan interest but there needed to be a bigger broader discussion. All we wanted was to dramatize what the reality is and then ask people to decide for themselves. McCreary; It seems like it’s above partisanship to loo at something that could cause literally world annihilation with open eyes, when we’re not in the middle of a crisis. OK, from scary reality to next year’s storylines — you opened the door for Elizabeth’s assistant Blake (Erich Bergen) to move up, didn’t you? Hall: Yes, we’re going to help him move up the ladder, broaden his scope of responsibility. We’re also going to move Henry (Tim Daley) closer to the inner sanctum with more responsibility.